Canon develops its first five-year plan in preparation for full-fledged entry into the business machine market. Canon Latin America, the company's sole distributor for Latin America, is established in Panama. Canon SA Geneva is established. By abolishing the sole-distributor system, Canon moves to a new sales system, with outlets under the direct control of the headquarters in Tokyo. Canon starts work on optical fiber development. An X-ray mirror camera is introduced. Tamagawa factory (today, the Tamagawa Office) opens, producing 8 mm movie cameras and lenses. 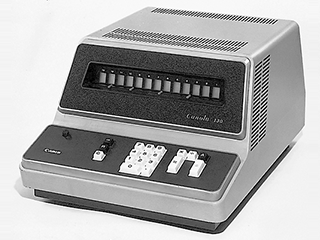 The Canola 130, the world's first 10-key electronic calculator, is introduced. Canon U.S.A., Inc., is established. Canon enters the copying machine field with the introduction of the Canofax 1000. The 30th anniversary slogan -"Cameras in the Right Hand, Business Machines in the Left"- is announced. The ratio of exports to net sales surpasses 50%. Canon Latin America, Inc., is established. Canon Business Machines Sales, Inc., is established in Japan. Canon Amsterdam N.V. (today, Canon Europa N.V.) is established. 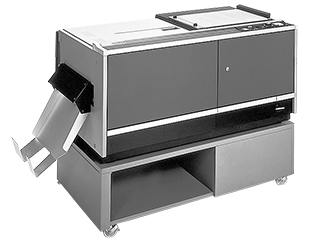 The Canon NP System, the original electro-photography technology, is introduced and Canon enters the plain-paper copier (PPC) market. 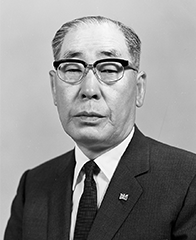 Canon Electronics is successful in the mass production of four-track, four-channel stereo recording heads. The company's name is changed to Canon Inc.
Canon Camera Sales Co., Inc., is founded for Japanese marketing. The Canon Research Center is established in Meguro, Tokyo. Fukushima Canon Inc. is established as a camera manufacturing plant. Canon Inc., Taiwan, Canon’s first manufacturing facility outside of Japan, is established. Canon enters the market for personal calculators. 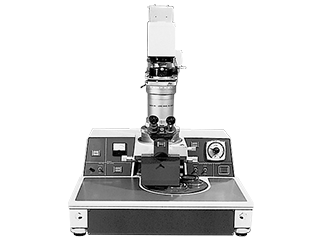 The NP-1100, Japan's first PPC, is introduced. The PPC-1, Japan's first mask aligner, is introduced. Canon Business Machines Sales, Inc., and Canon Camera Sales Co., Ltd., merge to form Canon Sales Co., Inc. The Canon F-1, a top-end SLR camera, and FD lenses are introduced. The BP-1000 billing machine is introduced. Canon enters the field of office computers. Canon Giessen GmbH, Canon’s first European manufacturing site, is established in Germany. The NP-70, the world's first PPC with the liquid-dry system, is introduced. Canon Deutschland GmbH is established. Japan's first full-color PPC is introduced. A macro zoom lens for cinematography wins an Academy Award in the science and technology category from the U.S. Academy of Motion Picture Arts and Sciences. Takeo Maeda is appointed president of Canon Inc.
Canon Business Machines, Inc., is established in California, U.S.A.
Optron, Inc. (today, Canon Optron, Inc.) is established. The Canonac 100 and 500 office computers are introduced. The Communicator, a portable "tape-writer" for the speech impaired, is announced. Canon initiates sales of the Optacon, an electronic reader for the blind. Canon France S.A.S. is established. Canon succeeds in developing a laser printer.